President Jokowi meets with Minister of State for Foreign Affairs of Saudi Arabia Adel Al Jubeir at Royal Guest House, Riyadh, Sunday (14/4). Photo by: BPMI. 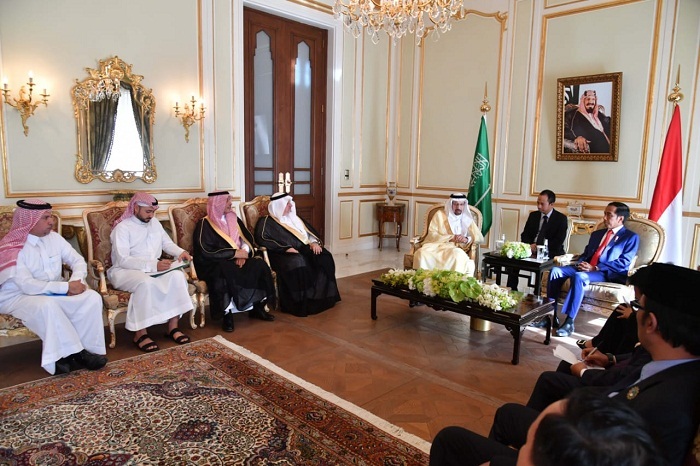 The Kingdom of Saudi Arabia applauds Indonesia’s leadership both on regional and global stages, including Indonesia’s role in the United Nations Security Council (UNSC), according to Minister of State for Foreign Affairs of Saudi Arabia Adel Al Jubeir. 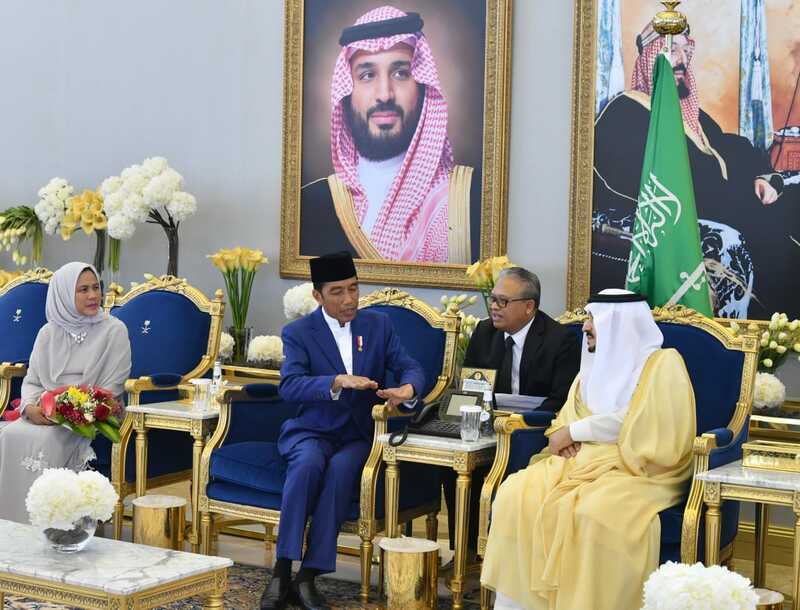 The Minister made the statement when he paid a courtesy call on President Joko “Jokowi” Widodo at the Royal Guest House, Riyadh, Sunday (14/4). 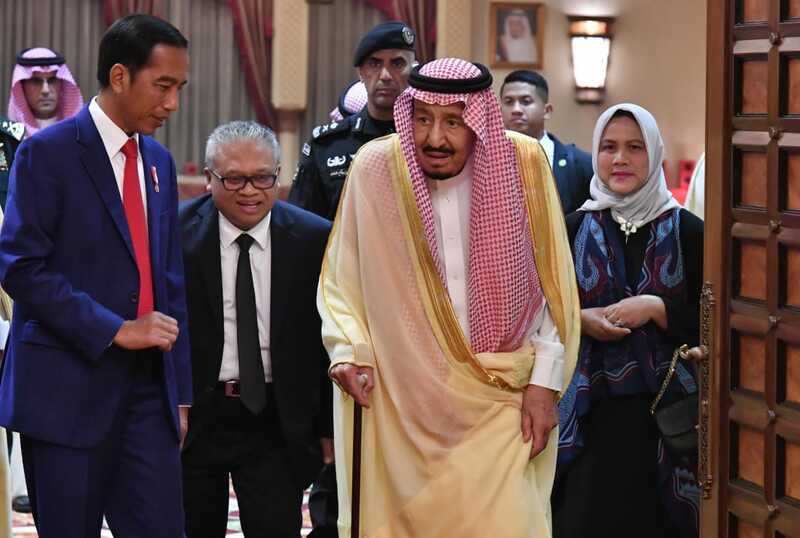 President Joko “Jokowi” Widodo and King Salman have agreed to boost economic cooperation between Indonesia and Saudi Arabia. 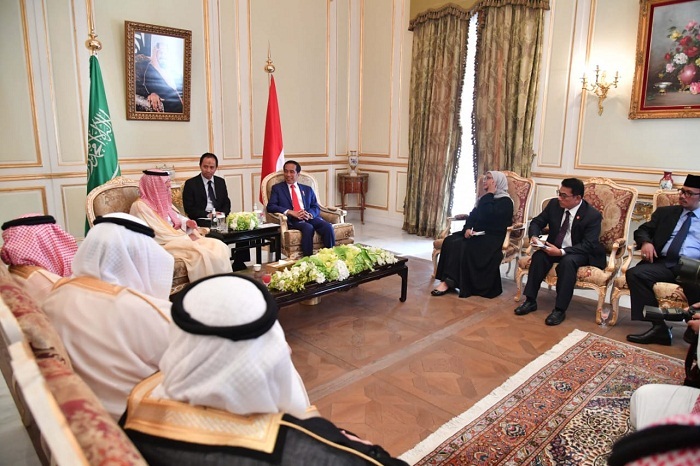 “President Jokowi and King Salman have agreed to strengthen economic cooperation in the future, especially in the fields of energy and tourism,” Indonesian Minister of Foreign Affairs Retno Marsudi said after the meeting between the President and the King at the King’s Private Palace (Al-Qasr Al-Khas), Sunday (14/4). 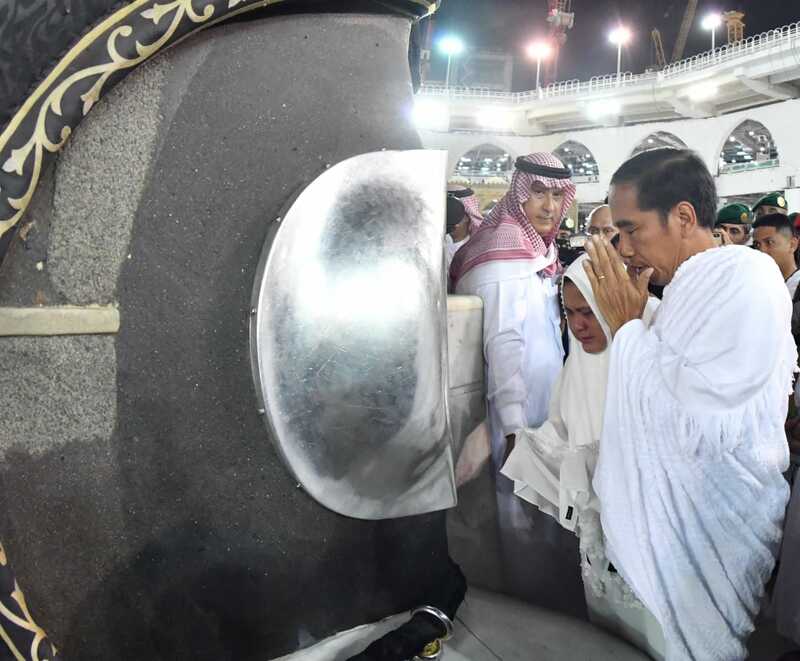 President Joko “Jokowi” Widodo on Monday (15/4) performed Umrah (small hajj pilgrimage) ritual on his visit to Saudi Arabia. On this occasion, the President and First Lady Ibu Iriana were also given the opportunity to enter the Ka’bah. Besides Umrah, President Jokowi was scheduled to have a number of official meetings with King Salman at the King’s Private Palace (Al-Qasr Al-Khas), as well as with Minister of Foreign Affairs Adel Al Jubeir and Minister of Energy, Industry and Mineral Resources Khalid Al-Falih at Royal Guest House, Riyadh. 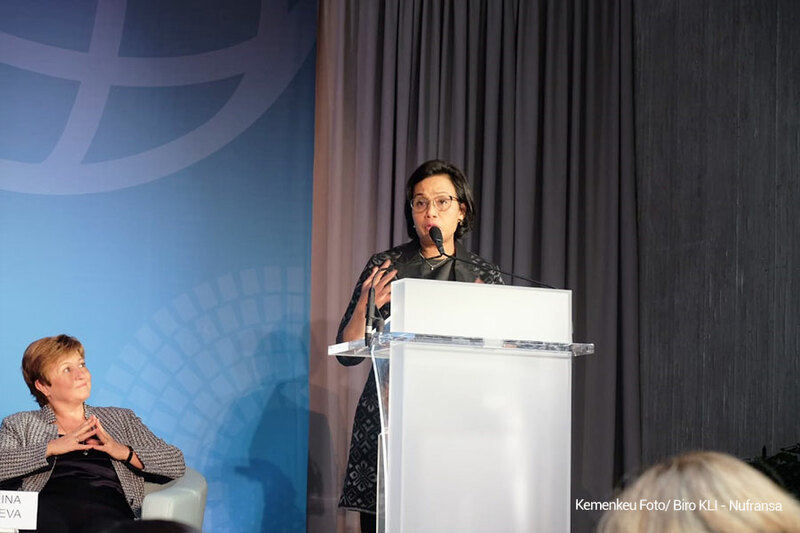 Finance Minister attends the IMF forum at Washington D.C, Friday (12/4) local time. 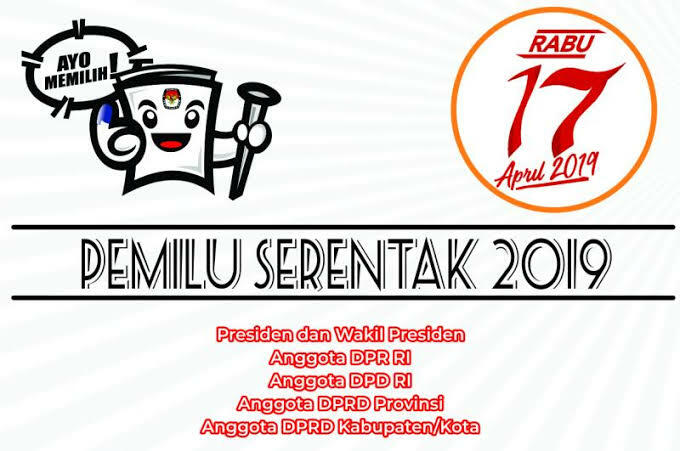 (Photo by: Ministry of Finance). Sri Mulyani made the statement during the 2019 International Monetary Fund-World Bank Group (IMF-WBG) Spring Meetings at Washington D.C., the US on Friday (12/4). Deputy to Cabinet Secretary for Cabinet Work Support attends closing ceremony of First Level Functional Translator Education and Training in East Jakarta, Friday (12/4). 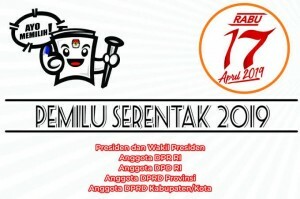 Photo by: PR/Oji. 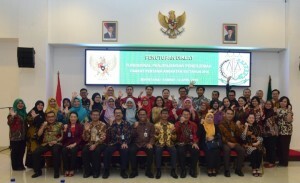 Cabinet Secretariat as the Fostering Institution for Indonesian Government Translators (known as Pejabat Fungsional Penerjemah/Translator Functional Officials) has successfully held First Level Functional Translator Education and Training for the third time, involving 22 participants from several Government institutions. “Based on our data, 175 Government Translators from all over Indonesia have participated in Functional Education and Trainings,” Deputy to Cabinet Secretary for Cabinet Work Support Yuli Harsono said during the closing ceremony of the First Level Functional Translator Education and Training in East Jakarta, Friday (12/4). Home Affairs Minister takes group photo after attending an event at Surabaya Trenggilis University, Surabaya, Friday (12/4). (Photo: Ministry of Home Affairs). 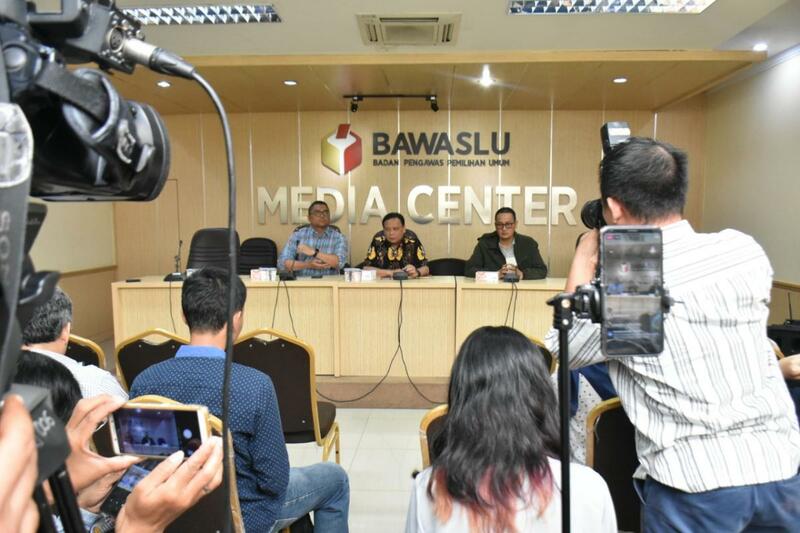 Minister of Home Affairs Tjahjo Kumolo said he is optimistic that voter participation in the 2019 General Election could reach 77.5 percent or exceed the target set by the General Elections Commission (KPU). He is also quite sure that the young generation will exercise their voting rights and not be abstained.